When the United States didn’t sign the Kyoto Protocol, cities stepped in to reduce greenhouse gas emissions. In 2005, Greg Nickels, then mayor of Seattle, called on other US mayors to sign the US Conference of Mayors Climate Protection Agreement, pledging to lower emissions of carbon dioxide (CO2) and other greenhouse gases. Cities are responsible for about 70 percent of CO2 emissions worldwide, and to date, 1060 mayors from Jacksonville to Juneau have signed the agreement. But there’s a problem. For cities to cut down CO2, they need to know how much they are producing and reducing. Most cities get rough estimates with “carbon calculators” that account for the size and population of a city, electricity used, and an estimate of how many cars zip (or crawl) through the city streets. The calculation would be fine except for all those cars, says Conor Gately, a PhD candidate in Boston University’s Graduate School of Arts & Sciences earth and environment department, who is lead author on a study examining cities, traffic, and CO2, published in the Proceedings of the National Academy of Sciences. “Cars are the hardest part of the emissions equation to quantify,” says Gately. “They are moving all the time at different speeds, and there are different cars on the road at different times of day.” There are other factors to consider. There’s the make of the car, of course: a Toyota Prius gives off less CO2 than a Chevy Silverado. There’s also the speed; most cars give off the least CO2 when cruising in a “sweet spot” between 40 and 60 miles per hour. It’s enough to make anyone despair of ever getting an accurate CO2 count, but ignoring cars is not an option. Why? Because vehicles are a critical part of the carbon equation, according to Gately, producing 28 percent of fossil fuel CO2 emissions in 2012, responsible for almost half the growth in total US emissions since 1990. President Obama recognized this when he pledged to lower US CO2 emissions by pushing hard on two sectors in particular, power plants and cars. 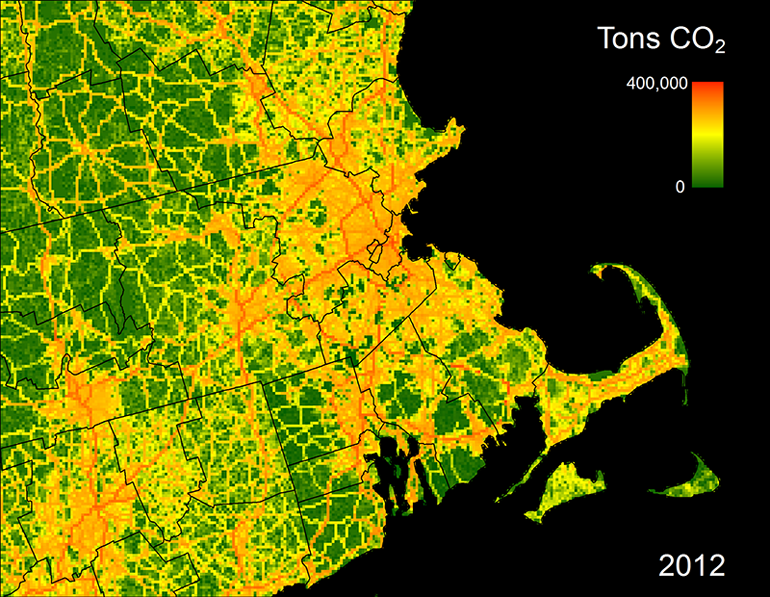 Available for free download, DARTE could change the way cities and states measure greenhouse gas emissions. “The science is coming together to bring us very fine measurements in a way never possible before,” says Lucy Hutyra, an assistant professor of earth and environment and a coauthor of the PNAS study. To build DARTE, Gately needed a source of traffic data, and he found one in the Highway Performance Monitoring System, developed by the US Federal Highway Administration (FHWA). The database contains traffic counts on over 85 percent of the public roads in the United States. All 50 states submit data to the federal government each year, and officials at the FHWA were happy to share it with Gately. He then faced the unenviable task—”pure grunt work,” he calls it—of assimilating 33 years of traffic data, of varying scale and quality, from the states. This helped him discern traffic patterns overall. But to determine CO2 emissions, he had to take it a step further, matching that data against estimates of the types of vehicles on the road during those years, correcting for changing fuel economy, and then validating the calculated tailpipe emissions with gasoline and diesel fuel sales for every state. Gately hopes that DARTE’s precision and ease of use will help cities locate CO2 “hotspots,” like certain roads or intersections, and target those hotspots through new policies, like altering traffic patterns, designing new streets, or targeting mass transit expansions. “We want to know how we’re doing and get some sense of where we need to make bigger efforts,” says Spector, who says he has already used preliminary data from DARTE to adjust their model’s traffic predictions. Gately plans to expand DARTE by including emissions data for other pollutants, like carbon monoxide and sulfur dioxide. Even if the federal government eventually implements national targets for all greenhouse gases and air pollutants, DARTE will still be useful, says Gately. The National Aeronautics and Space Administration (NASA), the National Science Foundation (NSF), and the Department of Energy (DOE) funded the work.